Bound in white satin in London, ca. 1630, embroidered in silks with the motif of the pelican feeding her young (the Pelican in her Piety) on the front cover and flowers on the back. "PSALTER OF ANNE BOLEYN," in French. France, Rouen, 1529–32. Illuminated by the Master of the Ango Hours for Anne Boleyn. The decoration of this Psalter reflects the future queen's ambitions as well as her anxieties. It was commissioned between 1529 and 1532 when Anne Boleyn was queen in all but name: a period of triumph, but one still tinged with apprehensions over Henry VIII's frustrated attempts to convince Pope Clement VII to annul the king's marriage to Catherine of Aragon. The text in French (which Anne, educated in France, could read and write fluently) is of some importance. Anne had already declared herself a Lutheran in 1528, and this Psalter is possibly the first Protestant translation of the Bible to reach the English court. 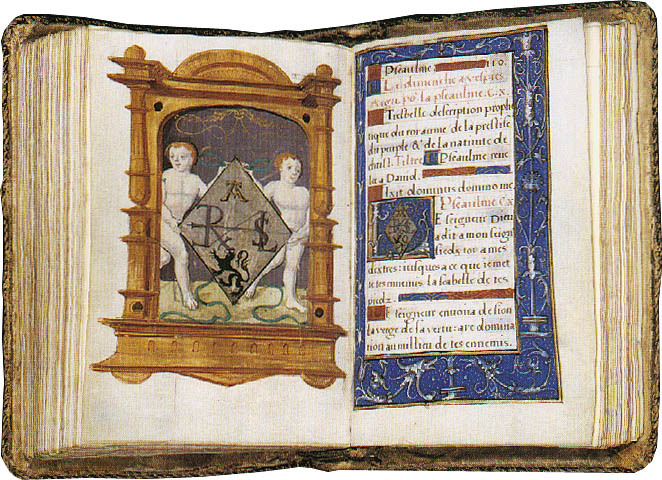 Shown here is the beginning of Psalm 110, marked by a miniature of Anne's arms. These include the monogram HEN REX LS, which stands for "Henricus Rex—liege souverain" (King Henry, sovereign lord). It is surely no accident that this monogram appears first—and full-page—at the psalm whose themes include the subjugation of enemies, righteous kingship, and divine priesthood.